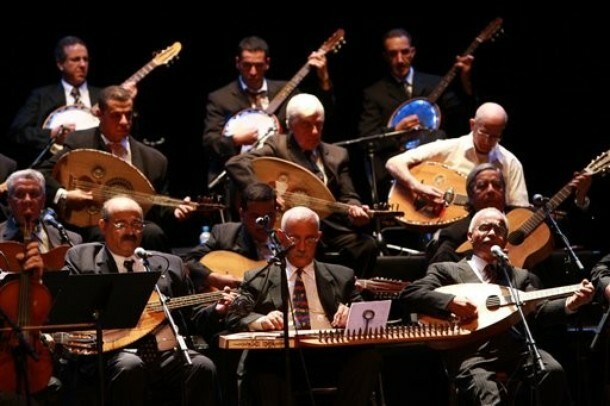 After nearly a half century of separation Algerian musicians have come together to continue what they had started long time ago in Casbah of Algeria. Casbah is known as the cradle of Chaabi music. Chaabi is by called many the ‘jazz of the orient’. El Gusto Orchestra consists of Muslims and Jewish musicians who have been making music for decades now. They are considered as some of the most important pioneers of Chaabi music. Many of them have been teaching in the conservatoriums of Algeria. However, because of the war in Algeria against the French occupiers, the musicians were separated as many of them left to France. In 2007 they came together and started a world tour. The 27th of November they were hosted at Bozar in Brussels. There are many excellent musician involved in El Gusto. Abdelmadjid Meskoud is the one who interacts with the public and coordinates on the stage. The spontaneous way and the subtle Algerian humor are clearly appreciated not only by the hundreds of Algerians in the concert hall, but also other music lovers. René Perez, who plays guitar,r is one of the leading vocals. It was during his songs that the audience was fully grasped in the melancholic part of Chaabi music. We could continue listing many of the other artists, but one who definitely deserves to be mentioned is the pianist Maurice El Medioni. El Medioni is the showman of El Gusto. Behind the piano he flows from jazzful boogie sounds to Andalusian and Occidental melodies. He is already 82 years old, but this man is still full of life. The concert of El Gusto was definitely a huge success. From children to old people (most of them Belgians of Algerian origin) were singing together with El Gusto. Some of the audience searched some free space left in the hall and started dancing till the last song. Maybe the most beautiful aspect of this orchestra is that it leaves space for improvisation and performs in all simplicity. Other musicians of this part of Africa, who are better known in the Western world, should take example from these artists. The connection with the audience is honest, no signs of arrogance, just each of them looking for its own expression and moment of connection with each other, with the music. And the way they find each other, clearly shows that the half a century separation has not damaged these musical friendships. In short, this is a group which you need to experience live. Don’t wait too long as many of the members aren’t the youngest musicians around.